EEEEAAAAKKKK!! You have just created the "go to card" for all these teen age b-day cards I am finding myself struggling to make!! This is PERFECT for teen girls (accckkkk! Do you have ANY idea how hard it is to make teen girl cards that your teen boy won't die of embarrassment when he gives it to her?!!) Aaaand teen boys!! You, my friend, just made my weekend!! PERFECT, Joan!! Do you have a template or die to cut your envelope liners? Awesome card and awesome colors!!! Very happy and pretty. Love the liner. 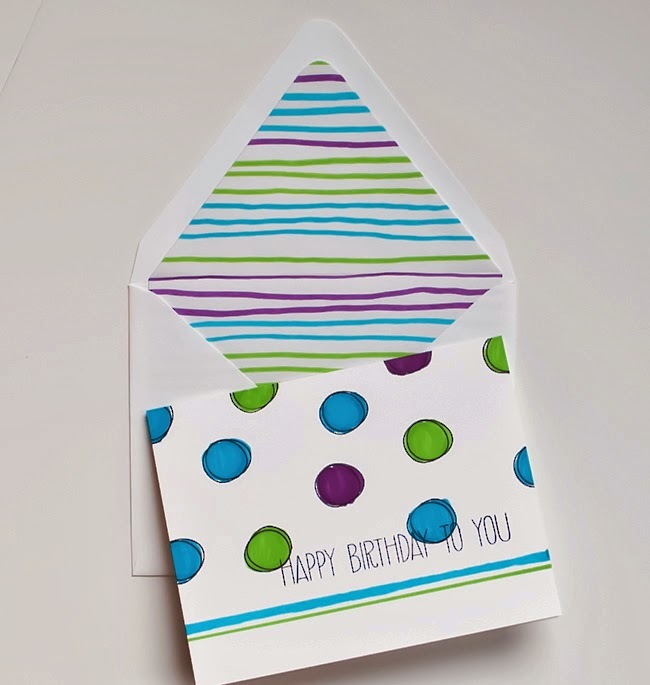 I love the dots on your card and the color matching envelope. A wonderful design. Joan. LOVE! What a fantastic color combo and design combo. Brilliant to think of lines and dots together. Truly a head thunker--like why did I never think of this? I always think more of the same, but this is so so much better. Getting pinned and cased, my friend. Joan, your card is perfect. Such an eye you have for clean and simple designs. Love the idea for the hand drawn lines to coordinate with the card. I needed a matching envelope for a tall card I made the other day, and I only have business envelopes with the blue printed security liner. I could stamp the outside of the envelope, but that blue liner was still homely. I remembered your envelope liners then, so made one from matching designer paper. Traced the shape of the envelope flap and trimmed a little and it came out very cute. So here's a big thank you for the inspiration! lovely!! very fun bday card!! Hi Joan!! long time, no "see"!! ;) Waving from sunny CA! !